European champions and Olympic favourites Germany won team eventing gold after the jumping phase of the three-day-event at Greenwich Park in London on Tuesday. 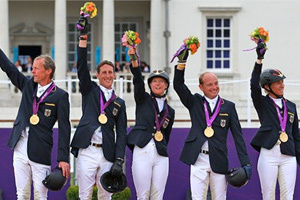 Team Germany repeated their 2008 Olympic medal-winning performance, and such was their supremacy that they clinched the team title even before their last rider went into the ring. The Germans completed the double, as they did in Beijing, with world champion Michael Jung winning the individual title and setting a record for the sport in becoming the first-ever rider to hold Olympic, European and World titles at the same time – an excellent way to celebrate his 30th birthday. The 12-fence track for the team competition was not over-big, but with plenty of twists and turns, including four roll-backs, and a tight time-allowed of 83 seconds it asked plenty of questions after the previous day’s tough cross-country challenge. A total of 53 horse-and-rider partnerships lined out, and there were just nine teams still intact, the Belgians going out of contention when Dunkas A (Marc Rigouts) and Lilly des Aulnes (Joris Van Springel) did not present for the final horse inspection, along with Donatien Schauly’s Ocarina du Chanois for France, and Michelle Mueller’s Amistad for Canada. The US team was reduced to four when Boyd Martin’s Otis Barbotiere was withdrawn in the holding box, along with Wag, the ride of Poland’s Pawel Spisak. There were just 12 clear rounds, and the first was registered by Italian individual Vittoria Panizzon who was lying 22nd after a great gallop across country with borough Penny Z. Her compatriot Stefano Brecciaroli was one of just two riders to have a refusal, and both happened at the vertical coming off a left-hand turn at fence 6, the Cutty Sark. Less than 10 penalty points separated the four leading nations as the action began, and nine time faults for Jonelle Richards (Flintstar) didn’t help the fourth-placed Kiwis, but the lovely clear from Linda Algotsson and La Fair was a great boost for third-placed Sweden. The excitement was ratcheted up another notch when Team GB’s William Fox-Pitt was clear well inside the time with Lionheart, although team-mate Nicola Wilson and Opposition Buzz hit the second fence. Germany kicked off with two down for Peter Thomsen and Barny, but Dirk Schrade and King Artus piled the pressure on both the British and the Swedes with a lovely clear. Meanwhile Caroline Powell’s living legend, Lenamore, showed that even though he celebrates his 20th birthday soon, he was definitely none-the-worse for his previous day’s endeavours when almost running away with his rider during the horse inspection and then lowering just the last element of the triple combination on course. Powell’s team-mate, Jonathan Paget, gave the Swedes and British some breathing space with one down on Clifton Promise, but when Sweden’s Niklas Lindback and Mr Pooh collected nine faults and Britain’s Zara Phillips and High Kingdom hit the second fence and then added three time penalties to their score line, the Kiwis kept looking stronger all the time. But in the end , none could match the mighty Germans who, with a single-fence advantage as the competition began, already had gold in their grip when Sandra Auffarth and Opgun Louvo gave an exhibition of jumping and Michael Jung and Sam followed suit. Swedish medal chances disappeared with a double-error for Ludvig Svnnerstal and Shamwari, despite a clear from Sara Algotsson Ostholt and the lovely mare Wega. But the Swedes still had individual gold in their sights when the latter’s rival for individual pole position, Germany’s Ingrid Klimke, had two fences down to disappear from the reckoning. Typically sporting, Klimke gave a broad smile and waved to the crowd, knowing she would soon have a team gold medal around her neck anyway. “I am so proud, but most of all I am proud of my horse (Butts Abraxas). He showed all his qualities here in London and to have just two fences down was not too bad,” Klimke said. It was a super-tight battle between Britain and New Zealand in the closing stages. Mary King’s round with Imperial Cavalier kept the host nation’s hopes very much alive, but Andrew Nicholson and Nereo matched that with a classy fault-free effort for New Zealand. However, when Nicholson’s fellow-countryman, Mark Todd, collected seven faults with Campino and Britain’s Tina Cook and Miners Frolic picked up just a single time fault, the host nation was assured of silver and the Kiwis of bronze. Britain’s silver is their 18th Olympic post-war eventing medal. German team trainer, Chris Bartle, said afterwards: “I’m delighted, and proud of the tremendous performances of this team. At the beginning of the week I brought them together and asked them to shut their eyes and dream of a gold medal around their necks.” It seems that worked a treat. The Irish team, which included Camilla Speirs and Michael Ryan, both eliminated after falls on the cross country course yesterday, claimed an historic fifth place finish behind Sweden. All the Irish Olympic mounts were Irish Sport Horses. The Irish team has produced some really quality performances, and despite being reduced to just a three-strong side, they stood firm today with Aoife Clark’s clear round from Master Crusoe putting pressure on the US and the Australians. And when Joseph Murphy matched that with Electric Cruise and Mark Kyle put just 7.20 faults on the board they demoted two giants of the game to show that, in the not-too-distant-future, they may return to being truly competitive in the discipline in which they once excelled.